How does this work: God's inerrant, sufficient Word of Truth, now infused with extra-biblical revelation and a voice that tells you he is Jesus speaking new words of comfort into your itching ears? What about Revelation 22:18, telling us this ought not to be done? The Jesus Calling Devotional Bible puts readers in touch with God and His answers for their life situations. 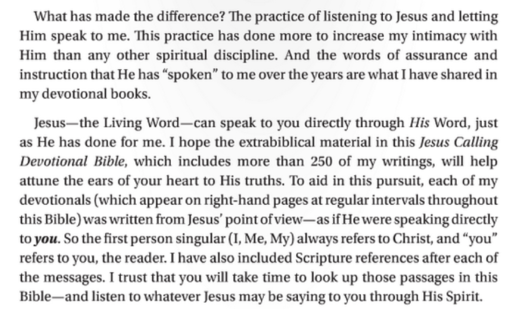 Missionary Sarah Young had been journaling her prayers for years when she began "listening" for what Jesus was saying to her within the words of Scripture. 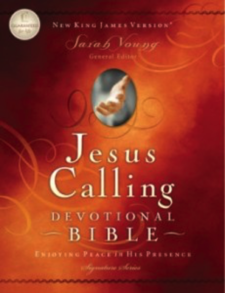 In this Bible, 260 scenarios pose life struggles to which Sarah Young gives answers from her Savior—words that Jesus has lovingly laid on her heart—words that have comforted and inspired Sarah and many others around the world. So what did they add to this "Bible?" What does this "Jesus" of the Jesus Calling Bible have to say? Clearly, this "Jesus" calling is the wrong number. Let's make sure we're dwelling in the real deal: God's Word alone. It is our authority. 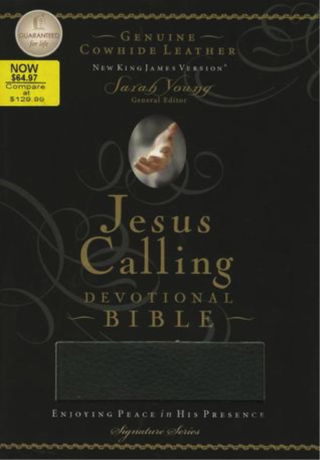 Jesus Calling and its many sequels and other products such as Dear Jesus, Jesus Calling Devotional Bible, Jesus Lives, Jesus Calling (Devotional for Children), Jesus Today, Jesus Calling for Teens, and Jesus Calling (Bible Storybook), are among the bestselling books in the world today. Young is offering people something they want to hear which is that they can experience the very presence of Jesus and Jesus will speak to them personally. The subtitle of the book is well chosen, for in this daily devotional the word “Presence” [of God or Jesus] is found over 400 times and the word “Peace” approximately 155 times, with synonyms such as rest and joy common place. Noteworthy is that both words are always capitalized signifying that apparently Young views Presence and Peace as God Himself, or at least representative of God. As one might imagine, the devotionals are highly redundant. If you read any ten, in essence you have read all that Young has to say. It does not take much analysis to realize that Young is a woman who struggles deeply with fear and anxiety. The vast majority of the supposed revelations from Jesus are words given to comfort her. Repeatedly Jesus has to promise her that He will never leave or forsake her (examples: pp. 24, 32, 73, 80, 103, 146, 156, 218, 224, 237, 265, 342). Jesus often invites Young to “rest snugly in My everlasting arms” (pp. 235, 373, 377), “Gaze into My eyes” (p. 270), “Rest in My loving gaze” (p. 299), and He informs her that He loves “to enfold you in My arms” (p. 303). As I read the book, with these constant references to Young’s obvious need for peace, rest, comfort, security, hope and assurance, I could not help but feel for her. This is an anxious woman seeking comfort and, on the basis of her popularity, she is not alone. Sadly she is wrapping her life around her problems rather than Christ, despite her constant references to Jesus. The emphasis is on what Jesus can do for her rather than the glory of Christ Himself. And of course this is the draw of Jesus Calling. But there are far deeper concerns than this. The real problem is Young’s premise that Jesus is speaking constantly to her and that we can have the same experience if we will follow her methods. In the introduction Young makes clear both her journey to and her understanding of her supposed direct communication from Jesus. As a young woman seeking to understand God, she had her first experience of the presence of God. It was “as if a warm mist enveloped me. I became aware of a lovely Presence, and my involuntary response was to whisper ‘Sweet Jesus’” (p. vii). The following year she claims to have had another encounter with the Presence of God but then she went for 16 years before she had any more experiences (pp. viii – ix). In between she had received her master’s degree from Covenant Theological Seminary (a conservative Reformed school in St. Louis) and served eight years with her husband as missionaries in Japan. In addition she earned a degree in counseling from Georgia State University. Then she read Andrew Murray’s book Secret of the Abiding Presence and began to seek God’s presence for herself. It was a difficult time for Young with ministry changes (they moved to Australia), cancer, four surgeries and intense pressures. One morning she “visualized God protecting each of us…which looked like a golden light. When I prayed for myself, I was suddenly enveloped in brilliant light and profound peace. I lost all sense of time as I experienced God’s Presence in this powerful way” (pp. x – xi). After another similar experience she began reading God’s Calling, a devotional book written by two anonymous “listeners,” “these women practiced waiting quietly in God’s presence, pencils and paper in hand, recording the messages they received from Him” (p. xi). Duplicating the methods of these authors Young moved from merely writing her thoughts in a journal (what she called one-way communication with God) to “listen[ing] to God with pen in hand, writing down whatever I believed He was saying” (p. xii). Young from that point on has seen her journaling as a dialogue with God and soon she was receiving frequent messages from God. Young says that she knows these messages are not as inspired as Scripture (p. xii), which is both interesting and troubling because every true communication from God is inspired, or “God-breathed.” God never communicates in any other way, although not everything God has said has been written in the Bible. Whatever caveat Young may offer, the bottom-line is that she is claiming divine inspiration for her writings. She is claiming direct revelation from Jesus, nothing less. Either she is receiving revelation, and is thus an inspired author of divine truth, in which case we need to add her writings to Scripture, or these supposed revelations are stemming from another source such as her imagination, or are made up, in which case Young is a deliberate false teacher. There is no room for a middle ground. Young’s message is that God “still speaks to those who listen to Him” (p. xiii, see p. 317), therefore the reason most do not hear His voice is they will not be still and quiet (as she is) enough to listen (pp. 317, 352, 367 370, 378). The idea that Jesus will speak to any who will be quiet before Him, and that He does so continuously (p. 317), is the great danger of Young’s teaching. But the draw is the promise of an overwhelming felt experience of the presence of God. Jesus tells Young, “Let My Love enfold you in the radiance of My Glory. Sit still in the Light of My Presence and receive My Peace” (p. 26), and “Look into My Face and feel the warmth of My Love-Light shining upon you” (p. 278) and “Sit quietly in My Presence, allowing My Light to soak into you and drive out any darkness lodged within you” (p. 294, cf. pp. 104, 259, 276, 284, 355). Sounds inviting – yet is it biblical? Nowhere in Scripture do we find God promising such experiences. We walk by faith, not by the felt presence of God. Even Young warns that discernment is needed lest one be deceived by supposed voices and experiences that may be from other sources (pp. 66, 102). But to Young, and those who follow her, experience trumps Scripture. While acknowledging that the inner voices she hears are not on a par with Scripture, nevertheless, “They were helping me grow closer to God” (p. xii). “This practice of listening to God,” she writes, “has increased my intimacy with Him more than any other spiritual discipline, so I want to share some of the messages I have received” (p. xiii). Obviously to Young Scripture is insufficient; new revelation is needed and that is why she has written Jesus Calling. All this is not to say that Young is not often on the mark biblically. Given her theological training much of what she writes is sound. And she uses Scripture, although it is often paraphrased to the point of changing its meaning or using it out of context (e.g. pp xiv, 15, 21, 45, 78, 91, 134, 177). Young’s emphasis is not explaining the Word of God but adding her supposed revelations to the Word of God. Jesus Calling and its entire offspring are among the most dangerous writings in the evangelical community today. Reviewed by Gary E. Gilley, Pastor, Southern View Chapel.